While it was certainly a disappointing loss Saturday, there are things i saw that show signs of improvement. Being an OL guy, I was interested to see how much the O line had improved. I’m pleased to say, that the O line is improved over a year ago. They look more sound and more physical. The defense however gave up three scores that to me are just mental errors. Below, the circled player in blue, once he reads run, needs to be flying up to blow this play up. 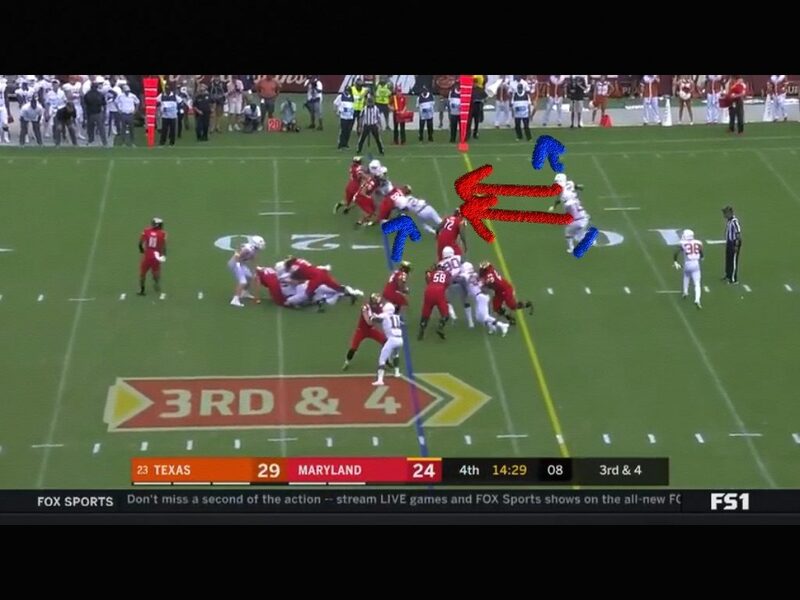 The two linebackers are at 7 yards depth to be able to see plays like this. They also need to get on their horse and get over there. This is a simple jet sweep. 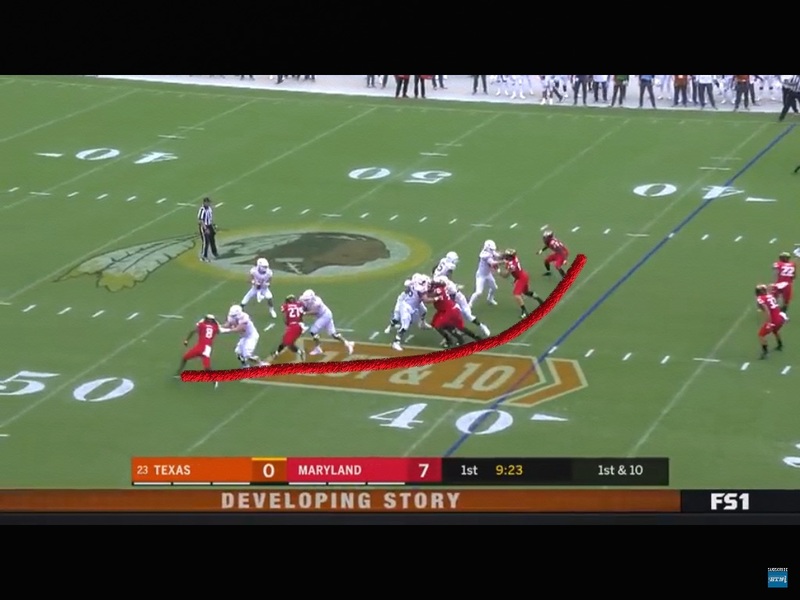 The outside player however isn’t aggressive enough in flying up, and the linebackers are too slow to get outside. The safety needs to be running the alley and bringing the hammer down on the true freshman. None of those things happen. The bottom defender fails to squeeze the hole enough, to get the runner to cut back up inside. The safety, who should be flying up and blowing it up, is playing patty cake. 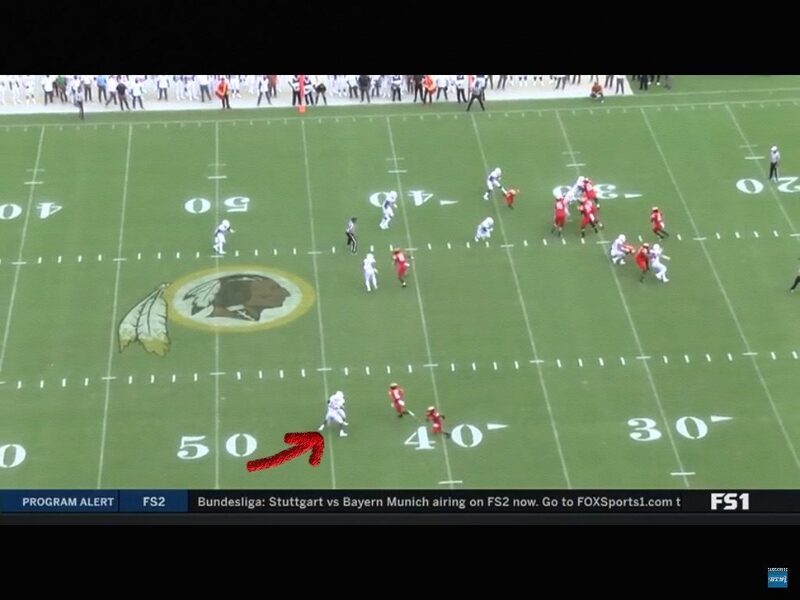 If either of these players are more physical, this forces this play back into the trail player instead of allowing it to be a long touchdown. 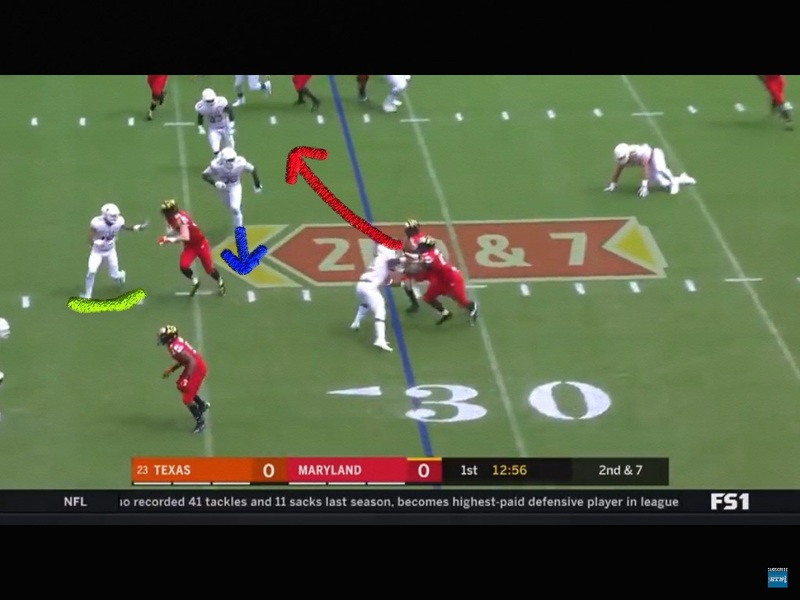 Maryland brought six guys here, and the protection is much improved over a year ago. Last year we saw free runners at Ehlinger all year long. Saturday not so much. Great protection here. And man Devin Duvernay can fly. 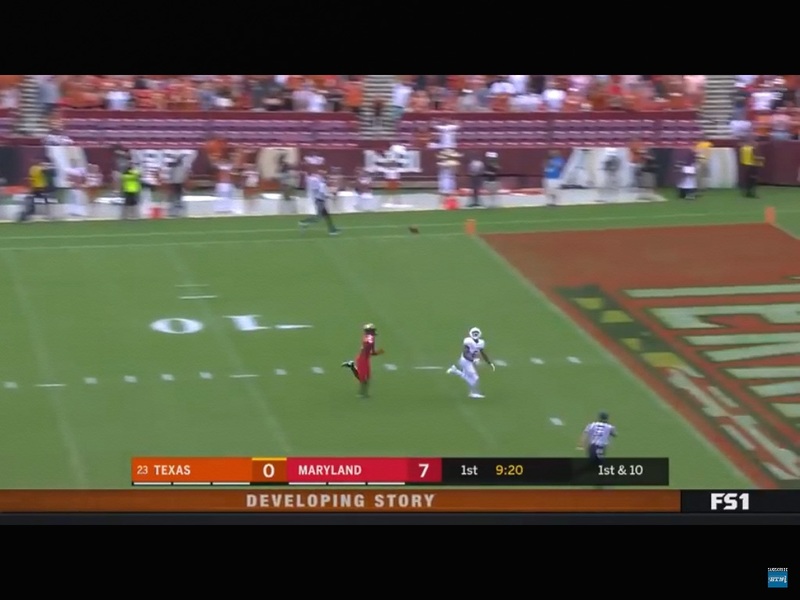 Texas has to find a way to get him the ball more. Not too many players in the Big XII can match his speed. Nice play all the way around, and a great pass by Sam. The blitzer here has to blow up this blocker to force him back into the QB, and the D Line has to win more one on one match-ups. 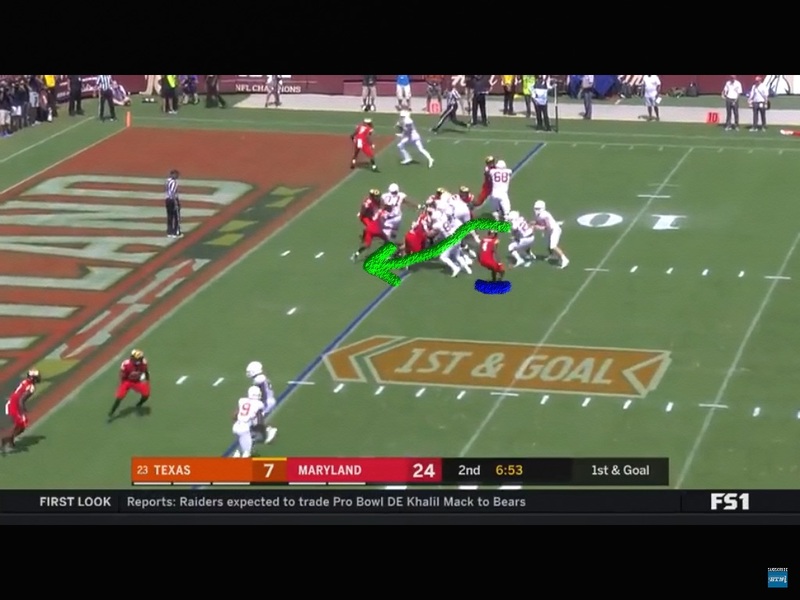 The blitzer is too timid, and with no pressure by the d line, it allows the QB time to get back to the switch at the bottom of the screen. 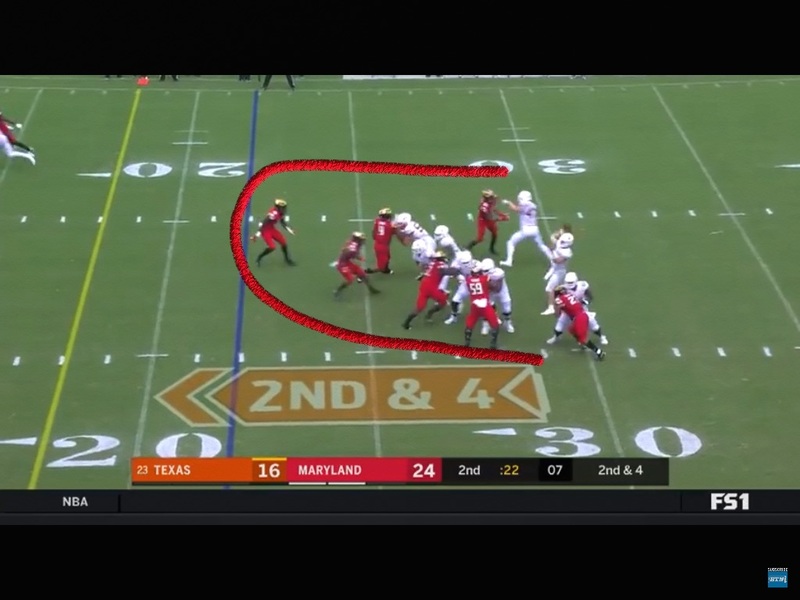 That blitzer has to put a swim move on em instead of accepting getting blocked. And this is something that can never ever happen in your secondary. On a basic switch in man coverage, the defenders run into each other. Like the jet sweep earlier, this is a basic play. Todd Orlando has to be losing his mind in Film. Here’s another example of an improved o line. 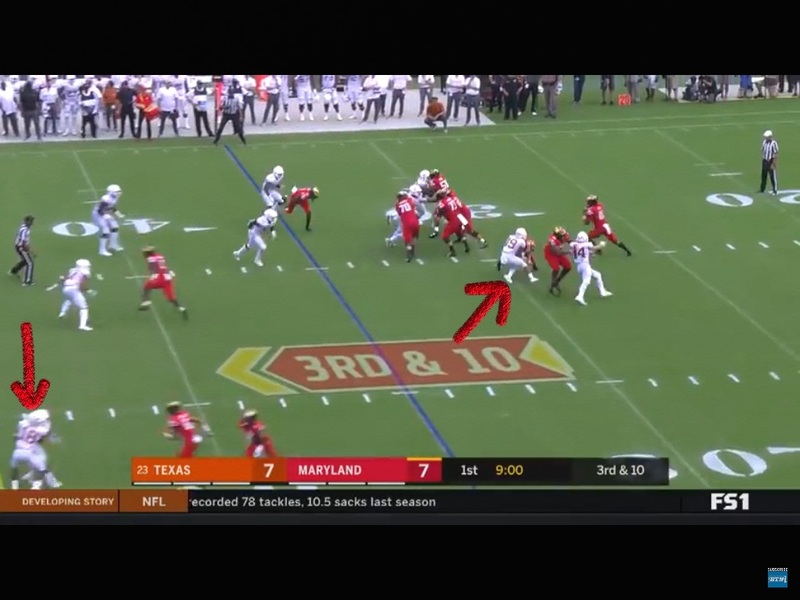 While I’d like to see more push playside with the tight end, still it’s solid blocking. With the read defender flat footed, the give is the correct read here and Sam executed very well to put six points on the board for the good guys. 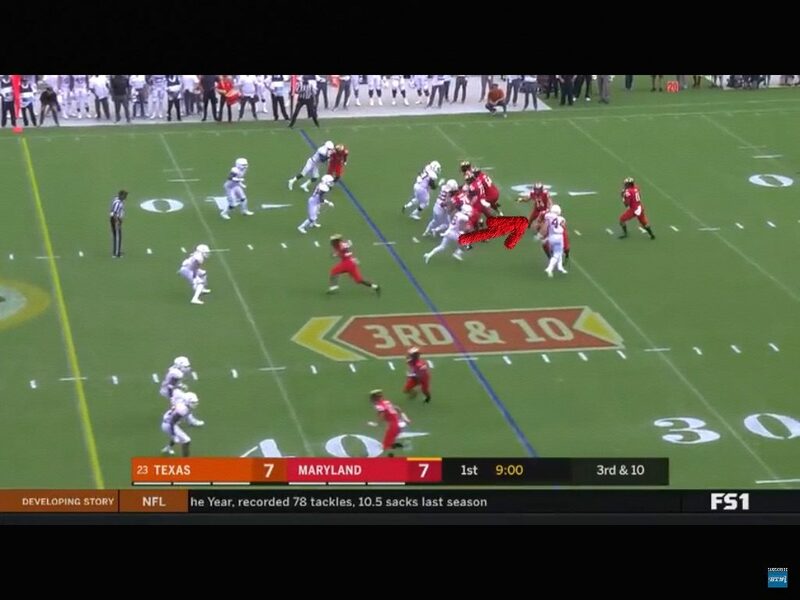 Here’s another all out blitz by the terps, and another great job in pass protection by the line. 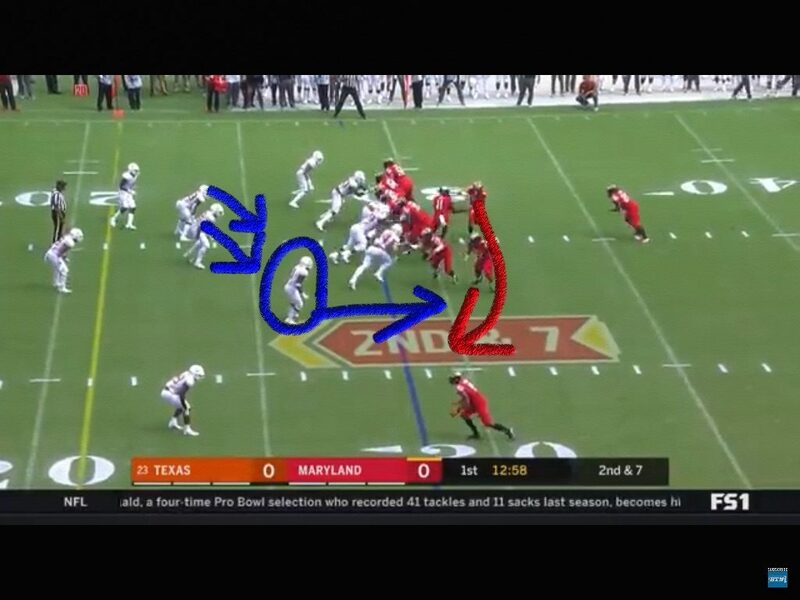 6 guys blitzing with a spy only leaves the ability for the secondary to have help on one route. Sam makes a great read and throws it up to his play-maker. 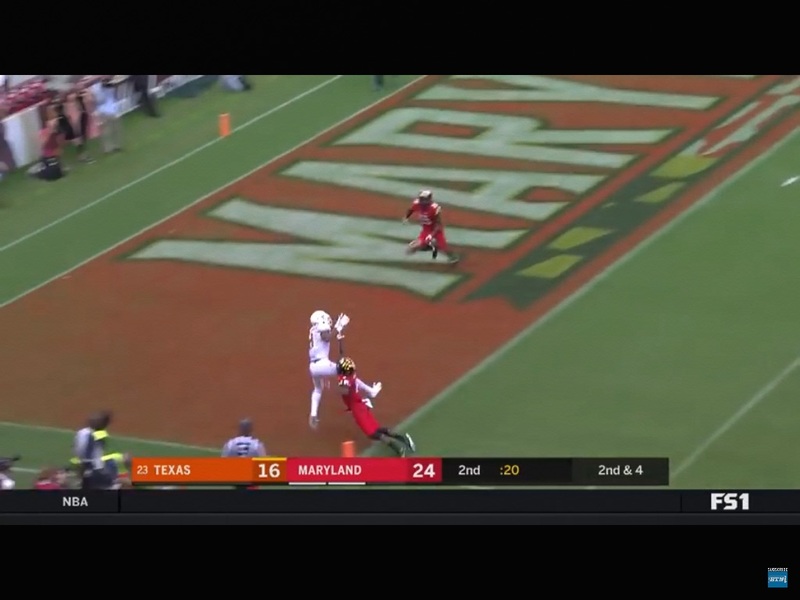 Texas has some serious, seriously talented receivers who can high point the ball and make plays on it. If I’m Tom Herman, I’m looking like the Raiders of the 70s with go deep almost every other play. The O line showed us Saturday they can protect and give Ehlinger time. This stuff will loosen up the underneath routes and the run game a lot. 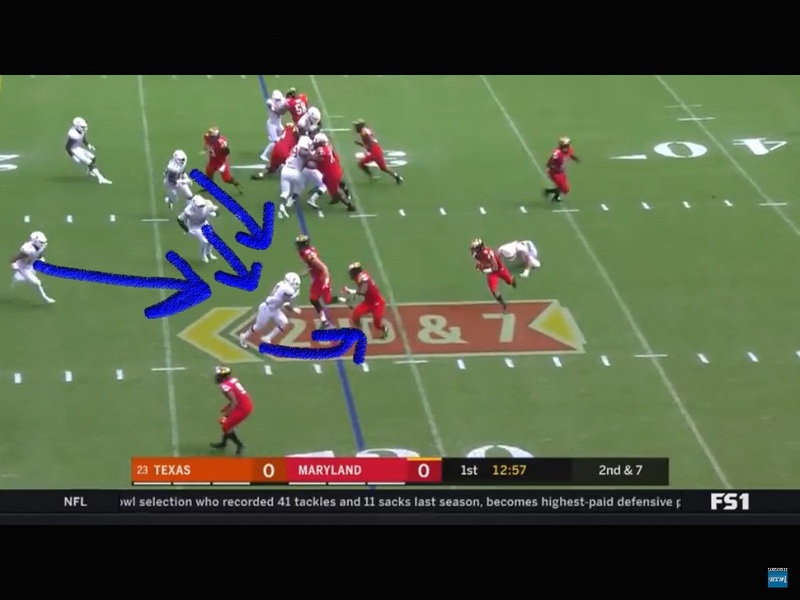 Almost the same play as the one we saw before, and this time the OL gets a better push. 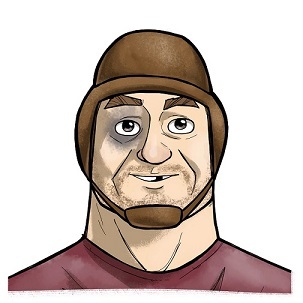 With two edge rushers coming, Sam has no choice but to give the ball up inside. Kyle porter walks in untouched. As the season wears on, I think we’ll see that this team is much better than a year ago offensively. Like I said earlier, I’d like to see the secondary be more aggressive in run support. 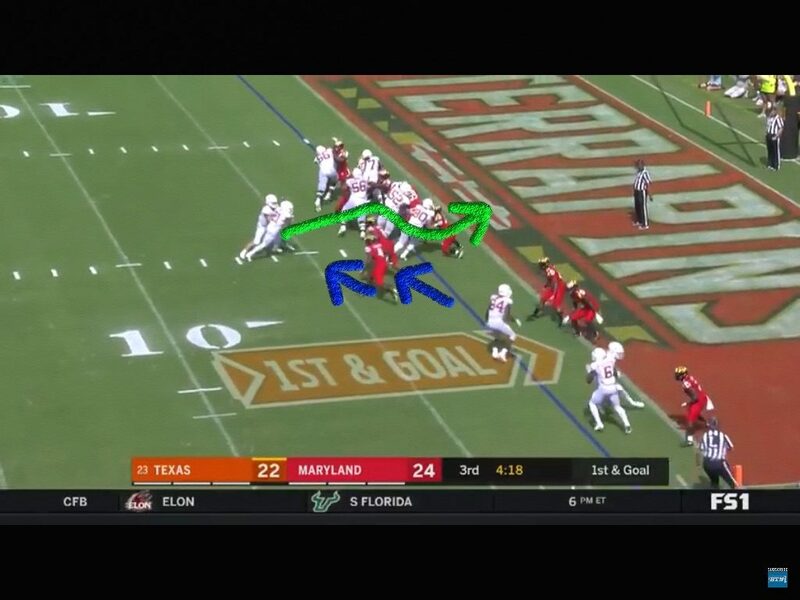 The player on the 10 with the blue mark under his feet needs to be up there smacking this guy, and the top defender has to get down there as well instead of bailing to the sideline. The tackler here has to get his head across & #38 needs to get on his horse and get over there. With a lead, in the fourth quarter I’d like to see these guys play with their hair on fire a little more. They’ll need to get this corrected and I’m sure that Coach Orlando has been lighting guys up this week. Three of Maryland scores should have never happened.